I love having the opportunity to try some different approaches to studying literature. I have heard of Progeny Press, but until they became a vendor for the TOS Homeschool Crew, I hadn't really taken a close look. Middle School (grades 5-8) is where the selection increases dramatically, with 36 titles. Some that jumped out at me were titles from the Chronicles of Narnia series and Wrinkle in Time. Crew members reviewed The Bronze Bow, Across Five Aprils and The Cay. High School (grades 9-12) includes 37 titles. So many of these jumped out at me, including a number of titles by Shakespeare, Tolkien and Lewis. 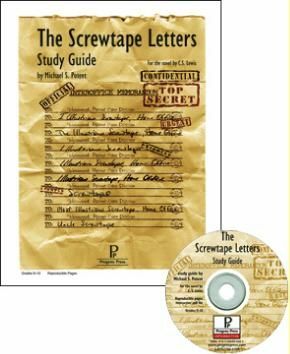 Crew members reviewed Pride and Prejudice, Julius Caesar and The Screwtape Letters. Connor was really excited about the idea of using the Study Guide for The Screwtape Letters, so we did. Right off the bat, I would caution that there are some mature themes in this book -- and in this guide. This is not a study I would undertake with anyone younger than high school. A Read Me file that tells you a bit about how to use the study guide and recommends things like making a back-up copy. The Interactive Study Guide, which you can print for the student to use, or you can save a copy for each student and let them fill in the answers in the text boxes and multiple choice buttons. This interactive part does not work on an iPad (or at least it didn't for us), but is so nice on the laptop. An Answer Key, with both the answers to the easy multiple choice types of questions, and a paragraph or two for the short answer essay questions. We are really enjoying this guide. Progeny Press recommends that the student read the entire work, and then start working through the various sections of the book. That didn't seem like a great approach for us, so we went through the reading for an individual section, and then Connor worked on the questions. Some, he did orally in discussions with me, and some he wrote up. The book is broken up into sections, with questions in the guide to go with each. The questions include vocabulary, various short answer questions, a "Dig Deeper" section that requires a bit more thought, and an optional activities section that includes research papers, art projects, essays, etc. Some literature analysis types of questions do come up in this study, but there wasn't a whole lot of it. We were wondering if that had to do with this not being your typical literature type of book. Overall, we really are enjoying this. Progeny Press recommends you spend about 8 weeks per guide, using four in a year. Our conclusion is that we wouldn't want to do Progeny Press study guides exclusively, but spending one quarter each year doing one guide would give us a different take on lit. We've already decided that we'll be doing The Hobbit in the fall. That would have a built-in deadline, December 14. Give or take. If Connor doesn't finish up the guide, he won't attend the movie. We are also planning to do these at least at the middle school level, with William and Thomas doing something together next year.